When it comes to choosing the right performance swimwear, you likely have your preferences. If TYR competitive swimwear is just your style, there are certain things you need to consider as you make your final decision. The following tips will help you select the appropriate swimsuit to ensure you can train your hardest and perform your best. Learn how to choose TYR swimwear. Women’s TYR swimwear in particular comes in a variety of designs from which you can choose. Not only do you need to decide which one is more comfortable for you, but you also need to understand what the various advantages of each type are so you can make the best decision for your training efforts. For instance, the crossed straps of the Crosscutfit provide an enhanced range of motion you can’t get from many other options. However, the Diamondfit design is more conducive to supporting the back. Finally, TYR offers an “X” design with thin straps that provide a middle ground between the previous two suits. For those looking for more support, the Maxfit suit features thicker straps that offer the ultimate in support. For men, there are a number of options as well. As you look at the TYR competitive swimwear, you will find traditional briefs, which create more drag than many of the other choices. Jammers are similar to running shorts and offer more coverage that also reduces the amount of drag. In addition, for training purposes, TYR offers a line of drag suits that are meant to create more drag to help swimmers focus on particular aspects of their technique. Once you know what kind of fit you prefer for your performance swimwear, you can move on to choosing the right materials for your needs. TYR features a long-lasting fabric designed just for this company called Xtra Life Lycra. This is in addition to the traditional Lycra suits. However, if you’re looking for training swimwear that doesn’t cost as much, TYR also offers nylon and polyester swimsuits. It’s important to keep in mind these swimsuits won’t last as long as the other materials available. When you’re searching for the right TYR competitive swimwear for your training needs, it’s important to know what you should look for. In addition to selecting the right colors, you will also have your choice of designs for both men and women, as well as materials. If you’re looking for the best selection of TYR swimwear, contact us. We carry everything you need to help you be a more effective swimmer. 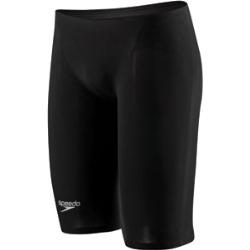 The Speedo LZR Elite Jammer is just one example of great competitive swimwear. Competition swimming often requires a different type of swimwear than what you would wear for a leisurely swim at the beach or community pool. This is because competitive swimwear is designed to cut down on water resistance so you can swim as fast as your ability allows. As you seek the right swimsuit for you, it is important to know some of the top names in competitive swimsuits so you can choose the best. When you are considering your swimsuit for competition purposes, the Arena swimwear line is one of the best in the business. From the unique compression points and sleek design to the material, you will find just the right suit to meet your needs. For men, the Carbon Pro, XP and R-Evo+ are great options to provide you with optimal performance. For women, there are even more options among the Carbon Pro, XP and R-Evo+. Find the one that best suits your needs. Speedo isn’t just a big name with your leisure swimwear; they are also one of the biggest names in competitive swimwear. When you choose a Speedo suit, you will know you have a top-quality suit that provides you with every advantage in the water. Some of the top suits in from this brand for both men and women include the Fastskin, LZR Elite and Aquablade. Another of the big names in competitive swimwear is the TYR line of suits for men and women. When it comes to the TYR line, you will be able to combine the design you need to do well in the water with great colors that will have you standing out from the rest of the crowd. The best TYR swimwear for your competition needs include the AP12 Compression and Tracer. When you have a need for competitive swimwear, it is important to know which brands you can trust. You want swimwear that will provide you with the streamlining you need to cut through the water with the least resistance. No matter how good of a swimmer you are, too much resistance can be detrimental to your ability to win. When you choose a swimsuit from Arena, Speedo or TYR, you know you have one that will last and provide you with the features you need to be the best you can be in the water. The best swimsuits allow you to best showcase your own talents.